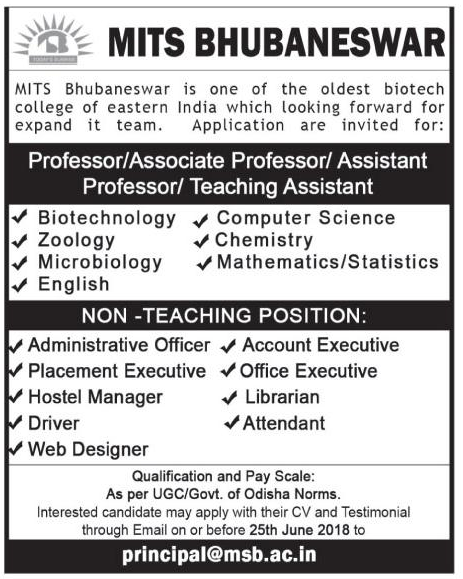 MITS, Bhubaneswar has advertised in Sambad newspaper for the recruitment of Professor/Associate Professor/Assistant Professor jobs vacancies. Interested and eligible job aspirants are requested to apply with in 25th June 2018. Check out further more details below. About College: MITS School of Biotechnology,has carved a niche for itself among the best Biotech-schools in eastern India, having been ranked consistently among the top colleges. The institute was established in the year 2003 with due recognization from Department of Higher Education, Govt. of Odisha and affiliated to Utkal University, Bhubaneswar.